Near freeway. Clean rooms and very nice staff. Check-in and check-out are easy. I was travelling for business and it was a decent place to stay. I wasn't wow'd or blown away, but pleased with the conditions. This hotel have a great staff. This hotel fits any need. Very elegant and cozy. Top notch and well worth it. Location is good. Close to variety of eating places and to interstate. Easy to find. Drove in 15 hours for an LSU game. Hotel was easy to find and a quick 10 min drive from the stadium. Room was clean and beds were comfy. Couldn't have asked for much more for the price. Will stay again in November. Excellent location, very clean room and professional staff. Will stay again, enjoyed the staff! It was very close to the big mall in town & great for what we needed. It was price competitive with everything in the area and very clea & spacious! My room looked like I was the first person to have ever stayed there. If you are looking for clean, quiet, and comfortable, this is the place! I was very pleased with the size of the room and decor. Very clean and pleasant. The beds and linens were cool and comfy. Had a great nights sleep. The Breakfast was great except for the powdered scrambled eggs. Other than that, we had a great stay here and will return here on future visits to LSU. This hotel was exceptionally clean and the staff was friendly. My only complaint is about their satellite televisions -- the connection was awful and there were only about 15 channels that would actually come in. I had to be moved from my first room into another because the first television wouldn't power on at all. Other than TV, my visit was very nice (the breakfast was delicious). Nothing less than you come to expect at Springhill Suites, but the staff was beyond friendly and helpful. The hotel staff was extremely friendly. Great breakfast every morning. They only had one waffle maker and you had to wait in line for a waffle, but it was well worth the wait, the kids loved them. We stayed here to go to Blue Bayou and the mall. The hotel was very close to both. I would diffently stay here again next summer. Front desk personnel helpful and cordial. Well-maintained property. Very impressed! The hotel was great. It was not check in time but we were able to check in early. The room was a great size and the beds were comfortable. We didn't stay but one day but the stay was great. Will stay here again. The Good: Nice hotel located just off freeway in downtown Baton Rouge. The hotel was very pretty and our room was clean. The staff was very kind and the free breakfast was wonderful--more than just your continental breakfast! The hotel itself was quiet and had an indoor pool, small exercise area and free wi-fi. The room had two TV's a mini-fridge, microwave, kitchen area, two beds and a fold-out sofa bed. It fit our family just fine and the price couldn't be beat. The Bad: Located downtown but you need a car to get anywhere. Not within walking distance of anything but a hospital. Wi-fi was difficult to get in the rooms, although out in the lobby it worked well. The pool was indoor but not well heated. I called ahead to make SURE the pool would be warm enough for my kids to swim (this was the big reason for us booking this hotel) and they assured us it was warm. Heated? A little. Warm? Not enough. My kids were very cold and didn't swim long. The beds in the rooms rest on a platform (instead of on a bed frame) and we constantly stubbed our toes on or tripped over those platforms! Not a good design at all! This isn't a luxury hotel, but it was a nice, middle range hotel, nicer than others in this price range. I felt very safe and comfortable with my kids there. I would recommend it to someone who wanted a nice place to stay on a budget. When in town to watch the Tigers we always stay at the Springhill Suites. Clean, spacious, well appointed room in a great location. Helpful staff and a complimentary breakfast make it a great value! Supposed t o be smoking room but was non-smoking ALSO ELEVATOR was down twice during one night stay. 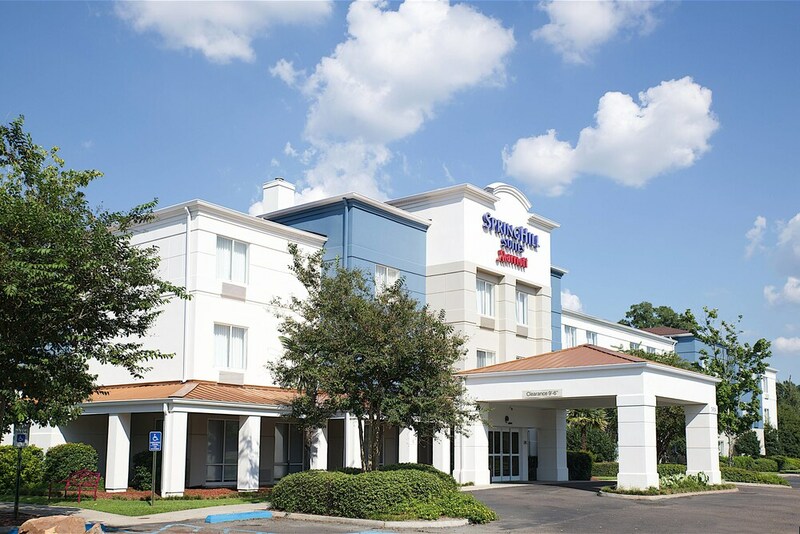 Located within a 5-minute walk of Rural Life Museum, Springhill Suites By Marriott Baton Rouge South is within 2 miles (3 km) of Mall of Louisiana. This 78-room, 3-star hotel has free breakfast, an indoor pool, and a 24-hour fitness center. A flat-screen TV comes with cable channels, and guests can stay connected with free WiFi. The bathroom offers hair dryers and free toiletries. Other standard amenities include a sofa bed, a sitting area, and a refrigerator. Springhill Suites By Marriott Baton Rouge South features an indoor pool, a 24-hour fitness center, and a meeting room. Free parking is included with your stay. The front desk is staffed 24 hours a day to help with dry cleaning/laundry and securing valuables. Additional amenities include a 24-hour business center, coffee/tea in a common area, and free newspapers. good for a one or two night stay. Recreation features at Springhill Suites By Marriott Baton Rouge South include an indoor pool and a 24-hour fitness center. The preferred airport is Baton Rouge, LA (BTR-Baton Rouge Metropolitan): 18-min drive, 13.1 mi/21.2 km.